One of our most regularly (and the easiest) recipes we put together are soups. 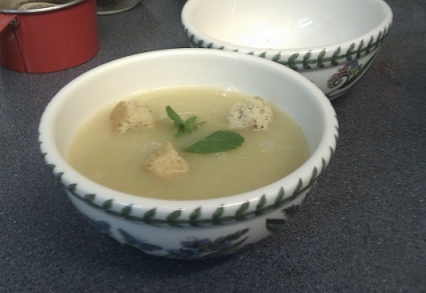 Today we had AitP artist Jill Newman‘s Cold-buster soup. It’s great for those days when you want to fight off colds or just want to strengthen your body’s natural defenses. Since we loved it so much, here is the recipe! Chop onions and garlic finely and “sweat” in a saucepan over a very low heat in the butter/ oil (this must be minimum heat for maximum time (30 minutes) in order to extract a sweet, caramelized flavour). Add the crushed spices for the last 5 minutes and the star aniseed. After 30 minutes, turn up the heat to medium and add the sherry/ wine. Allow the alcohol to evaporate then add pints of water. Add vegetarian stock/ bouillon and bay leaf then simmer on a low heat with lid on for 30 minutes. Remove from heat and hob and add in the lemon juice and finely chopped parsley. Serve into bowls with pinch of black pepper and mint. Serving suggestions: Great with croutons thrown in and alongside cheese on toast. We have now grown our very first cauliflower! 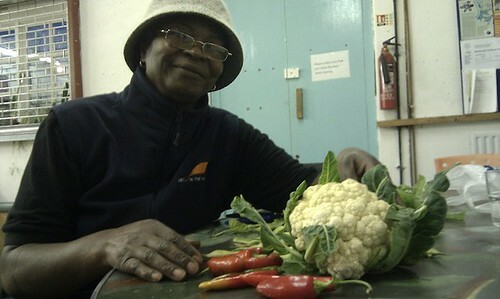 Our volunteer Cynthia works hard in the garden to grow lovely seasonal produce for our famous communal lunches. Along with the cauliflower are also some chillis and spanish borlotti peas. Here at Art in the Park, we usually make lunches out of the available produce we get from the gardens. Very much like ready, steady, cook! 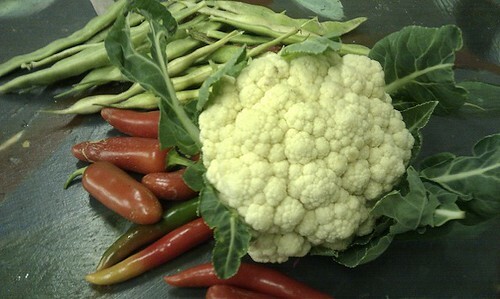 Cauliflowers, chillis and peas? Hm…we could make a lovely spiced cauliflower, onion, potato and coriander curry, ideal for the coming winter days. Can you think of anything else we could do with these?